Games Workshop have recently released another Dark Angels FAQ/errata. This follows a month after the "Canadian" FAQ of 10 June 2008 and goes some way to redressing the strange rulings presented therein, as well as adding clarifications that we have been waiting for since the release of the 4th Ed DA Codex some 16 months ago. I will treat this FAQ as a whole new item despite many items being the same as that of the "Canadian" FAQ, so everything will get looked at. 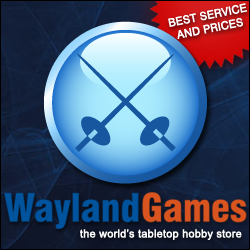 There are 6 items in the errata section where typos are cleared up, and 14 rules questions clarified and in some cases new rules added. Many of the queries were not serious issues, but some were, so let's not be ungrateful. At least we get clarification on Sergeants and sniper rifles; and taking a Razorback for a 10-man squad — both of these being key things that need sorting out. However, the flip-side is that since the release of the 5th Edition Warhammer 40,000 (July 12th 2008) there is now a serious discrepancy between the Ravenwing Combat Squad rule and Combat Squad point scoring issues generally, with what is stated in the new Rulebook. I should imagine another FAQ will be along very soon to sort these out. Typo addition: Clearly stating only one Company Standard per army. Comment: Useful, but by RAW was pretty obvious anyway I think. I hadn't heard of anyone trying to use more than one anyway so I can't believe this was ever a burning issue. Comment: Well it's RAW so it wasn't an issue really, but useful nonetheless. Has no great implications on how the game is played from a Dark Angel perspective. Comment: Long overdue this one and will save a lot of repeat questions I should imagine. Obviously all 10 can't sit in it at once, but for a combat-squaded unit it's a useful transport choice and it allows you to put either combat squad within it too don't forget as it is not combat squad-specific. Comment: Sorts out an issue that was RAW anyway, but did cause some headaches. New Rule:Useful for those who want to build a drop pod rule, otherwise of limited use. Comment: An odd one this, but does bring Codex DA into line with Codex BA. Clarification: Uniquely DA Masters can have three weapons — but they must follow WYSIWYG. Clarification: Reinforces that all combi-weapons are the same cost. New Rule: At last, we now know we can fire our Rhino's PMS backwards if we want! Comment: A useful clarification for sure and might stop some arguments as sometimes this was indeed an issue. But really this will all be covered when the 5th edition 40k is published as there are now specific rules to cover this one. I should imagine there will be a further FAQ to retrofit the new rule if needs be. Clarification: Clearly states what can be done. Comment: Good clarification, one of the advantages of carrying a bolt pistol now fully set in stone. Still, it doesn't help you to remember you can do it though does it? When the new Space Marine Codex is released all marines will be this way anyway. Comment: Many played it this way anyway but nevertheless this is a very welcome clarification. Comment: Again, similar to the Scout Sergeant issue, another good and much needed clarification. New Rule: Clearly stating when the choice has to be made rather than on the fly during the game. Comment: A necessary addition to stop any ambiguity but no real change. Q: When deploying Ravenwing Attack Squadrons from reserve, can the bike and attack bike units deploy on the table to utilise the Scouts Outflank ability, leaving any attached Land Speeder either in reserve or deploying from your own table edge as a normal reserve unit? Q: The Ravenwing Combat Squad rule clearly states that Bikes, Attack Bikes and Speeders are point scoring, despite the 5th Edition Rulebook stating that only non-vehicle Troop Choices can be point-scoring. So does this mean that all Ravenwing units are point-scoring, even if not Troops and/or and vehicle? A good solid addition to the DA rules that be honest is a great improvement over the previously released "Canadian" FAQ. I am glad they have resolved a few of the long-term niggling issues, but unfortunately 5th Edition have thrown up a few more. Maybe these will be resolved sometime soon. In the meantime, we have the release of the new Codex Space marines this Autumn that will inevitably bring more to light (judging by some of the rumoured changes I have seen) that will need to be added to the growing "unresolved" list.